It may not have the glamour of the first day but there are certainly some great players to be found in the second and third rounds of the NFL Draft. Hell, there were still some players still in the green room in New York like Courtney Upshaw of Alabama, Coby Fleener of Stanford and the above pictured Stephen Hill of Georgia Tech. 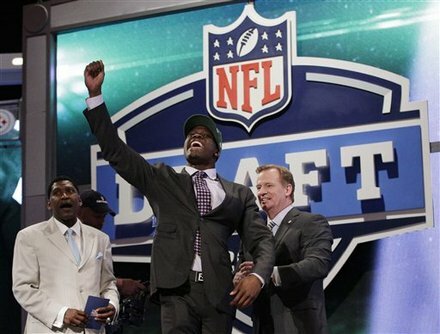 Here are what I thought were the best picks of the second day of the 2012 NFL Draft. When you have a young quarterback that if the future of your franchise, you need to acquire him weapons for him to utitilize. After the departures of Dallas Clark and Jacob Tamme, the Colts had a big hole at tight end so why not fill it with the top tight end on the board? And one who played with Andrew Luck in college? Colts got a great value with Fleener here. The Ravens came into this draft with a vacancy at outside linebacker after Jarret Johnson signed with the San Diego Chargers. Upshaw is a little big to play outside linebacker in a 3-4 scheme, hence why he fell into the second round, but Terrell Suggs had the same questions and he has worked out pretty darn well for Baltimore (Charlie Campbell makes the comparison here to him and Lamarr Woodley). But Upshaw's ability to pressure the passer is too much for Ozzie Newsome to pass on here. The Jaguars were pretty terrible last season rushing the passer in what has become a common occurrence for them, even as Jeremy Mincey broke out for eight sacks last season. Branch is a solid value for the Jags early in round two because he has the ability to contribute right away thanks to his explosive speed off the edge but he needs to improve his overall game to be more than just a speed rusher. We all know why Jenkins fell into the second round as he has clear character issues, considering the fact that he got kicked out of Florida and the fact that he has fathered four children by three women already. But you take away the issues and you have one of the elite cover corners in this draft that could have gone in the top ten. Jenkins has star potential and if Jeff Fisher keeps him in line, he and Cortland Finnegan will make for one nasty corner combo. Silatolu saw his draft stock rise into late first round territory before falling slightly into the second night of the draft and he makes a lot of sense for Carolina as he is very talented and can play either guard, as Travelle Wharton was cut, or tackle, as Jeff Otah has really struggled to stay on the football field. He is raw, as most FCS prospects are but there is clear talent. Another really good value pick here at Glenn's stock peaked in the teens and he seemed to be a sure first round lock, or at least in my mind. After an already weak offensive line lost left tackle Demetress Bell, who signed with Philadelphia, Buffalo really stood to select a talent line prospect and thus Glenn is a great fit. He compares to Leonard Davis as one who could be a solid tackle but is a stud at guard. We shall see where Buffalo lines him up. A year ago, Martin was a top ten prospect. He should have gone in the 20's in my book so Miami is getting great value to finally replace the awful Marc Columbo at right tackle. Martin is a tremendous run blocker but needs to work on his pass blocking, making a better fit for the right side and since that is where Miami would be playing him, this makes clear sense. Have to protect your franchise quarterback in first round selection Ryan Tannehill and it is wise moves like this that do just that. The Jets like to move up and be aggressive to get the guys they want and they did that here to get a really good value in Hill, who has the tools to be a star. He has great size (6'4" and 215) and has great speed, was the fastest receiver at the Combine, and thus should be a natural deep threat. He does come into the pros very raw as he never ran a route in Paul Johnson's option attack and comes in rawer than Demaryious Thomas, who was more productive. But the talent is clearly there and the Jets need receivers. The Bears have needed real threats at wideout for several years now and while they made the shrewd move for Brandon Marshall, they needed another weapon. Thus their move up for Jeffery makes a ton of sense as Jeffery has the physical ability to be a star wideout. There are weight issues with Jeffery and he could be the next Mike Williams (from the other USC) if he does not get his act together. But overall, I think it's a good risk. Now there really was not a huge need for a player like Reyes but for really good value at a spot where you could never have too much depth, it's a good move. I think Reyes is a much better fit for the 3-4 than last year's first rounder Corey Liuget and many mocks had him sneaking into the bottom of the first round. Reyes is a very strong and tough run stuffer at the point of attack. The Packers made a rare trade-up to take Worthy who helps fill a big need at the five technique opposite B.J. Raji, where the Packers were getting no production whatsoever. Worthy has the skills to be a really good pocket penetrator and should help improve Green Bay's pass rush. The questions I have with him is why he was not more dominant in his senior season as he had some awesome games and some disappearing acts. Still a really good value as some had him in the first round. I am a big proponent of having a deep defensive line as it helps keep players fresher and more rested and thus getting a really good value with Still to add some depth behind Geno Atkins and Domata Peko at tackle. I've seen Still compared to Atkins as he projects to be a talented pass rusher on the interior of the defensive line, which should get him work on third down. The fact that he can play end makes him even better. I still do not get how Konz falls all the way to the 55th overall pick; I felt that he was a much stronger prospect than his teammate Kevin Zeitler, who went in the first round. He had some medical issues but they should not have made him fall this far. He's a great value and a nice addition to the interior of the Falcons line as he can play guard until Todd McClure retires. I saw some mocks at one point have Adams going all the way up at 13 to Arizona. That I didn't agree with but Pittsburgh is getting a great value here. Adams has had some trouble with his work ethic and some off the field problems but a team like Pittsburgh, which desperately needs help at offensive line, can take a risk on the talent that Adams has. Remember when the Bucs had some great linebackers, particularly when they won the Super Bowl? Well their linebackers have sucked over the last couple of seasons so the move up to take David, a great value at the back-end of the second, makes a lot of sense. David didn't impress at the Combine but he is a pure football player that is very instinctive and knows where to find the football. Bo Pelini coaches them well. At one point I had Curry going in the first round and thus as I saw him as an early second rounder, getting him here is a good value for Philadelphia. Andy Reid loves have a deep and talented defensive line and loves to invest picks in it and while as the Eagles used a first round pick on Brandon Graham last year, he is coming off a knee injury so bringing in a talented edge rusher in Curry is wise. So the last player in the green room a year ago was Randall Cobb and he went in the last pick in the second round to the defending Super Bowl champs. That worked out well for Green Bay. The Giants do the same thing here and find a good replacement for Mario Manningham. I wasn't as high on Randle as most as while he is physical, big and has great hands, I didn't see a lot of exposion but he makes a lot of sense here. I have no problems with the Colts doing the tight end double dip. Having two talented tight ends is the new thing in the league and tight ends are every quarterback's best friend. Allen is a very good blocker which should help the pass protection plus he has ideal receiving skills, particularly in the red zone. You need a deep secondary to succeed in the pass-first league of today and St. Louis adds another talented corner to what was a shallow cornerback spot, even with the signing of Cortland Finnegan. Johnson is a big and athletic corner who can run with fast wideouts and cover the big ones. In other words, he pretty much is the modern corner of today. Hillman went a round sooner than where he probably should have went but this is a guy who was incredibly productive at San Diego State, being a dark horse Heisman contender going into 2011. Hillman is small but he makes sense as a much needed third down back who can be a safety valve for Peyton Manning out of the backfield. A lot of scouts and draftniks love this kid all-around and think he could actually be a starter one day in the NFL. The major concern is his height, as he stands 5'11" on a good day. He is a tremendous passer with a great arm, quality accuracy and is very mobile. Seattle has money invested in Matt Flynn but not a whole lot and Wilson is a guy that can turn into a really good backup and maybe he can start down the road. The more I write, the more I like this pick. This is a guy that did not even get invited to the Combine but he has massive size, is surprisingly agile, and somebody that Mike Mayock refers to as a "physical freak." He fills a need at guard for Houston as they lost right guard Mike Brisiel to free agency. Some prick (pardon my French) pranked called this poor kid telling him that the Bengals had selected him at 27. Screw that guy but Cincinnati eventually did end up taking him in a very good value selection and he helps to fill a need opposite A.J. Green. Sanu is big and physical with great hands and is a guy that can go up and get the football. I remember reading about this guy after his freshman year at FIU and being very impressed. I watched him play a few times and he is one of those guys absolutely electric in space, whether as a receiver or as a returner. He should provide a gamebreaking threat in the slot for Andrew Luck and maybe they develop into something more. Like I wrote earlier, I love it when teams put together deep defensive lines. That's why I have absolutely no problem with the Bengals taking another quality value pick at tackle in Thompson, who should have gone a rounder earlier than he actually did. He shows a lot of skill in pressure the quarterback from the tackle position and busting the pocket. The Giants get a great value in Hosley, who should have gone in the second round and would have had he not tested positive for marijuana at the combine. You could never have too many corners and they find a replacement in the rotation for Aaron Ross. Hosley has got absolutely tremendous cover ability who should get a lot of picks in this defense.